The battle continues and the universe shudders. The battle to save the galaxy from the evil of Darth Vader rages on in this spellbinding STAR WARS sequel that is one of the highest-grossing films of all time. In a spectacular opening battle the Rebels suffer a devasting by an imperial army using At-At-Walkers. Han Solo (Harrison Ford), Princess Leia (Carrie Fisher) and Chewbacca survive, and fight a running space battle against imperial ships while Luke Skywalker (Mark Hamill) seeks out Yoda, the ancient Jedi master, to be trained as a true Jedi knight. Meanwhile Darth Vader is scheming to lure Luke to the Dark Side of the Force, or kill him in their final showdown - a stunning duel in which Luke learns the secret of his destiny. This dazzling adventure introduced the charming, shifty rogue Lando Clarissian (Billy Dee Williams) and Yoda, one of the most delightful, ingenious and instantly successful characters to ever light up a movie screen. An awesome array of special effects, blazing action, and imagination, THE EMPIRE STRIKES BACK is hailed as one of the greatest motion pictures ever made. 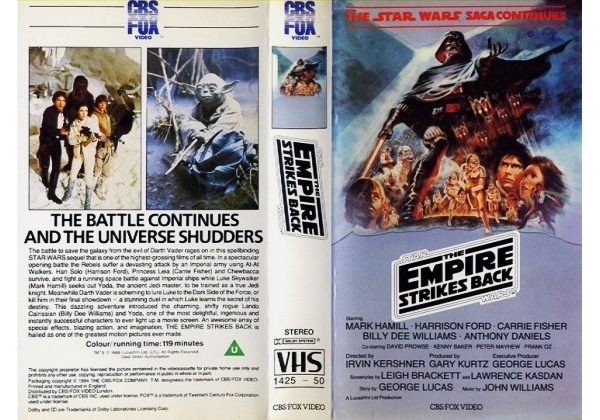 Or find "Empire Strikes Back, The" on VHS and DVD / BluRay at Amazon.